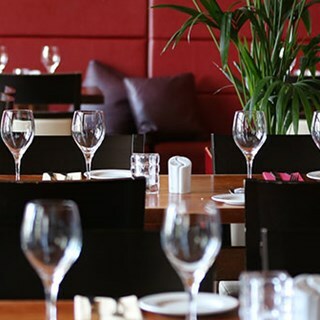 Since opening its doors July 2002, 107 Dining Room and continued to prosper and has become a well established popular dining destination on the Wirral. We offer contemporary dining in relaxed surroundings and consider ourselves to be very much a local restaurant looking after people living locally, people working locally and our doors are always open to people visiting Heswall and its surrounding areas. We always have a lovely meal here and service is good. A couple of things could have been better. We had to ask twice for water. Easily done to forget something I guess. Also, when waitress was putting new cutlery down she did so by the pronged end rather than by the handle which seemed wrong. It's always a tricky thing, recommending somewhere to eat to family, but we needn't have worried. Great, friendly staff looked after us from start to finish, and the food was amazing! Thank you too from very happy parents in what was their first visit to Heswall. Really relaxed, enjoyable evening - a joint birthday celebration with a friend. Everyone enjoyed their food choices, and the atmosphere was laid back and congenial. Lovely food and the staff were ten out of ten, perfect! Friendly staff, excellent food and lovely atmosphere. Have been going to 107 for 17 years with family and friends and always enjoy the experience. The menu is extensive and diverse so we felt spoilt for choice. The waitresses were all very friendly and helpful. The food was tasty and well presented. All in all we had a really lovely evening. yet again another really enjoyable evening with great food, fantastic service and relaxing atmosphere. The restaurant is looking decidedly shabby and could do with at least a lick of paint. The servers were friendly but not always attentive to coming back and seemed in a rush so that not everything was ordered and we had to ask a second time. However the food is exceptional and great value too so this would always usurp the above. Lovely meal! Staff and service were excellent. Menu is lovely however there were a couple of things that slightly disappointed us. This was our first visit as we like to try different places. My wife had the crepe to start with. The filling was nice but it was tiny and the crepe itself was stone cold. The menu says it's served with dressed salad leaves but it was just iceberg lettuce. It was nice but could have been better. 2 of us had pork schnitzel again served with a dressed salad which was lovely however because it went on the plate with the hot food the plate was cold and the fries and pork went cold very quickly. The garlic and herb butter tasted like margerine rather than butter too. I have to say the fries are disappointing as your meal would be nicer with proper chips but they were fresh and hot. I had fish and chips well fries again would have been nicer with chips and mushy peas which didn't really taste of anything. We were happy to pay and we are not complaining but feel you should have the feedback so you know how things have been received. We were just a little disappointed as the menu promissed a bit better than we felt it was. The service and food were excellent. The only negative was that my mojito did not taste very nice at all. The ingredients are pretty standard, so may have been a dodgy/cheap brand of rum. Otherwise, I highly recommend. Superb food and excellent service. Great bottle of Amarone on the wine list too. A very enjoyable experience with good food and very good service.